Thorsten: As it’s going to be your first Kona what are your goals there compared to 70.3 Champs? Emma: This year’s Kona is purely about going out there for the experience. I have heaps to learn about Ironman let alone Kona but really want to take my time with the journey and do it the right way, taking every bit of experience that I can from each race but without it taking away from the key goals of the year. The A race is the 70.3 Worlds, and this fits in perfectly with Kona after. Kona is ultimately the big life goal so I think it’s never too early to gain experience. T: You had to DNF at IM South Africa in April with an injury, is that completely behind you or is it still something to manage? E: I changed my bike position for South Africa and trained on it in our camp in Spain. But we trained predominantly in the hills and so I never really spent too long in the bars. We knew my shape was good and I wanted to be as aero as possible for what was quite a flat course because this is definitely one of my weaknesses at the moment. But I had back problems (at the time I didn’t know it was from the back) and the sharp pain in my calf halfway into the bike which was worsening every step on the run caused me to pull out. After that race I had some treatment for the great BMC-vifit staff on our camp in Mallorca and we readjusted my position and now all is feeling good. I still have to learn to spend more time in the bars to ride more strongly on flat courses but again this is something we are gradually building up over time to protect the back for a long-term career in Ironman. T: What have you learned from your first IM in Austria, and how will these lessons be applied to your Kona prep? 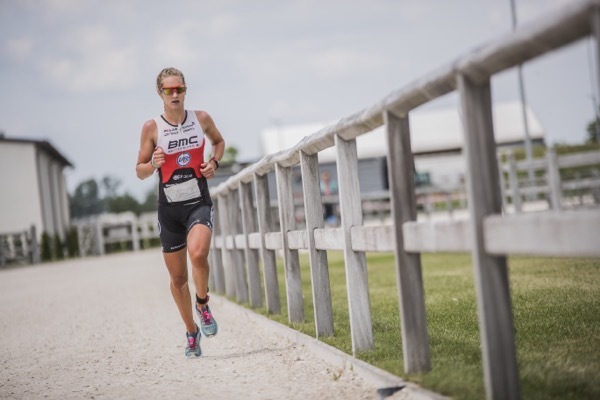 E: I loved the experience at Ironman Austria and it certainly sealed my ultimate goal that this is what I love to do and want to pursue for the future. I have a hell of a long way to go still on my nutrition but this was the same a year and a half ago for the 70.3 and from Austria we have already taken away some pointers on that. Also with my hydration, I am a very heavy sweater and we are going for some testing set up by the BMC-vifit team. I had a bad bike crash at the end of last year when I hadn’t drunk enough on the bike in Lanzarote and fainted descending one of the climbs. We had tests after this and I have a very low blood volume, blood pressure and heart rate so I need to keep super hydrated. I didn’t do this in Austria so this was a massive learning point to take forward and warning because I wasn’t very well after the race. But the overall take away was all the positives of how much I loved it, how much you can push and the real test of Ironman, I don’t think I have ever experienced anything better in my life! T: How will the logistics of 70.3 Champs, Kona camp and travel to Kona work for you? E: Unfortunately my best friend’s wedding (Olympic middle-distance runner Steph Twell) is getting married on September 28th and I’m her chief bridesmaid. So I have to fly back from South Africa to do a few weeks preparation in Lanzarote and then fly from there to the wedding and then out to Kona. My coach Michelle Dillon and her husband (my training partner) will be in Australia for AG World Champs so I will train on my own this time. But I think if you have the right attitude you make the best of it and just push everything possible. I will give this preparation all my best and I love the great team there at Sands Active who are hosting me! T: Is there something you’re looking forward to in Kona? How much of the “mystique” of Kona have you been following in previous years or are you just going in there without any pre-conceived notions? E: For sure, I think the harder the race the bigger the party right, so this one must be epic!? I don’t really know a lot about Kona but the week before will be staying with the BMC-vifit team and getting as many pointers from my teammates as possible! But as the pinnacle of endurance sport I think just being at this event is going to be amazing and I will be making the absolute most of my time there. T: Will you go into the race with a specific plan (is this something that’s still being discussed between you and the Dillons) or will you just “go with the flow”? E: I know that the game plan will be super thought-out and mainly targeted on my weaknesses (being nutrition and pacing! ), so I will really be trying to not get overexcited, keeping calm and being a bit more savvy in this one. But as always in a race I think it’s about pushing your body to the limit and getting the most out of the race. You’re always building up to one moment, to one pinnacle in your career. Every time you went for it and couldn’t quite hold on, made you stronger and all builds to the race of your life, the one that matters and the point at which your body is at its all-time fittest and you manage to hold the deepest of all darkest places. My training partner Stu Hayes is a good example of this: He spent his life trying to break away from the front of ITU fields – then eventually it worked and he won the Kitzbühl World Series race.